Yes, it's another cop-out[fit] post. I have a bunch of food pics on the back burner. We shall see when I finally get to them. This is what happens when I don't like a restaurant, or I don't like the pictures I took. I delay. So you get the cop-out[fit] post. 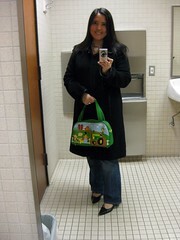 Coach wool overcoat, Banana Republic black tee, Kasil jeans, Stuart Weitzman kitten heels, Tarina Tarantino necklace, Paul Frank bag. I'm generally not a fan of Coach bags. Ok, I'll be honest. I quite dislike almost all of them, and I hate anything splashed with all the damn C logos. 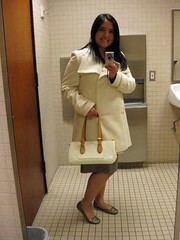 However, I do own two Coach items: (1) a plain black leather briefcase that I use when I go to court and (2) this coat. I got this coat several years ago on a whim when I went to the outlet store. I'd gone inside to escape the cold while Mr. Monkey was at Brooks Brothers. I blame that arctic day for this coat; the cashier cut off the tags for me, and I wore it right out of the store. I'm glad I got it, despite the billions of stupid Cs on the inner lining. It's long, sturdy, warm, and durable, even if it's not particularly interesting. The only things of note are the silver turnlock at the collar, which you can sort of see here, and leather trim on the collar and pockets. I wear it a lot. It's very practical. 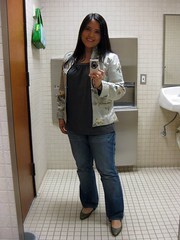 Vintage silk Mandarin jacket, Banana Republic gray swing blouse, 575 jeans, Manolo Blahnik sequined flats. It was a slightly warmer day, so I pulled out this shiny little thing. And it's really little -- too little for me to actually button up. Why? I got it from Mr. Monkey's late mother, who was much tinier than I am. When Mr. Monkey's father sold their large home to move into a smaller condo, he told my sister-in-law and me that we could take whatever we wanted from our late mother-in-law's extensive closet before he donated everything else to charity. You'd think that there would've been quite a tussle between us for the luxury loot, but it turns out we have vastly different taste and both left with exactly what we wanted. I came away with a bunch of bags, but this Mandarin silk jacket was one of only two pieces of clothing I pilfered. It has no labels, and there is something simple and luxurious about it. It is even reversible -- the inside is a brilliant turquoise. I sometimes wear that on the outside with a little black dress. Andrew Marc wool coat, yet another boring Banana Republic top (have you noticed a trend yet? ), Ann Taylor herringbone pencil skirt, Cole Haan Nike Air light bronze ballet flats, Louis Vuitton Monogram Vernis Rosewood Avenue bag. I wear white after Labor Day! And carry a white bag! Technically, the coat is cream, and the bag is "Perle," but who am I kidding? I might be ok, though, because the archaic rule purportedly applies only to things below the waist (i.e., pants, skirts, shoes). The jury is out, however, on the bag. It could be a violation. What do you think? I am going to say my bag is "winter white." The shoes were one of the items I scored while shopping in Vegas. I love love love them. I've had bad experiences with Cole Haan in the past (with Cole Haan Nike Airs, no less), but these shoes have definitely changed my mind. I feel like I could run in them. Adorable and comfortable. It should be noted that, this time around, I got my Cole Haan shoes in a half size bigger than I usually wear. Perhaps this is why my old Cole Haans were no bueno. Who knew I could write so much about my clothes? Don't worry. Your regularly scheduled food talk shall return soon. love mr. monkey's mom's jacket. re: white, it's southern california, and isn't that rule archaic anyway? whatevs, your winter white coat and vernis look fab. i need both a white coat and white bag still. The bag looks winter white to me, especially right up against your cream colored coat. you can wear denim to work?!? I'd love to have a white coat. It looks so cute on you! Based on your recommendation on wool coat vs. puffy jacket, I've been on the hunt for a red coat :) Red = less likely to get dirty by the clumsy me. Liz, we can wear denim every other Friday, provided we donate $5 to a designated charity. During the last week of December and first week of January, we were authorized to wear jeans every day if we wished, sans charitable donation. Love the white coat. White is always appropriate. P.S. Don't hate on Coach :) My trusty black tote has lasted through 3 years of college...and is still holding on strong. I love the winter white coat! I actually just love coats - they always look so classy. I've been addicted to the Nike air technology C.H. shoes for a while but the one handbag I got from Cole Haan fell apart in less than a year. I like the vintage piece the best! why do not you post about your outfit EVERYDAY??? That purse and coat are so Winter White. How the hell do you have so many coats, living in southern California? i don't care for a lot of coach bags, but there are quite a few "quieter" styles. i have a couple of them, and you honestly can't tell what brand they are unless i tell you. i think the coat and bag are both off-white, which makes them a-ok. i know i told you before that i'd wait till spring to carry the bag, but next to the coat it looks fab. You have an AMAZING collection of shoes. okay i love all of the jackets, they are so cute! You probably hate this word, but you are adorable. 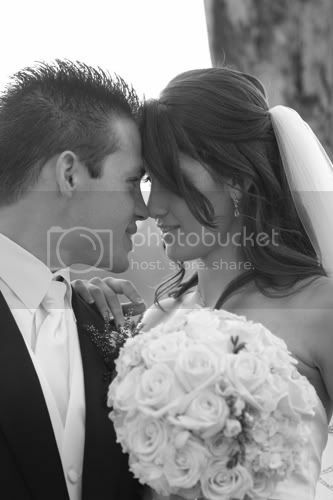 #3 is my fave! And 3 just happens to be my lucky number, but I digress. You already know I have loved my Cole Haans since day one. Both pairs are a 1/2 size larger than I usually wear, so you are definitely on the right track why your other pairs bugged. Great stuff. I envy anyone with more than one purse. 1) I have 3-5 coach purses, and yet I can't stand coach. I get them as gifts from kind hearted souls who know I love purses, but don't quite understand I'm a bag snob. 2) I LOVE BR tops. Almost all my work tops are BR. i love cop-out[fit] posts. but maybe its just because i'm a nosy neighbor! that's a beautiful jacket you got from Mr. Monkeys mother. It looks like she had some fierce taste! and the last one is so blair becomes a lawyer at the CIA I can't stand it. Goes without saying I love the clothing posts. Off white coats are the most wonderful winter items ever(hello...this week's Gossip Girl totally proved it!). And a coordinating bag is totally appropriate! I love the mandarin jacket on it. It's so chic and not fobby at all. I need a white coat and a red coat. <3 that satin jacket. so chic.